WASHINGTON, D.C. – As the economy gradually recovers, nonresidential construction spending remains unchanged—a good sign the downturn in the industry has stopped, according to the Construction Backlog Indicator (CBI) produced by Associated Builders and Contractors (ABC), which remained nearly unchanged between the second and third quarters of 2013. 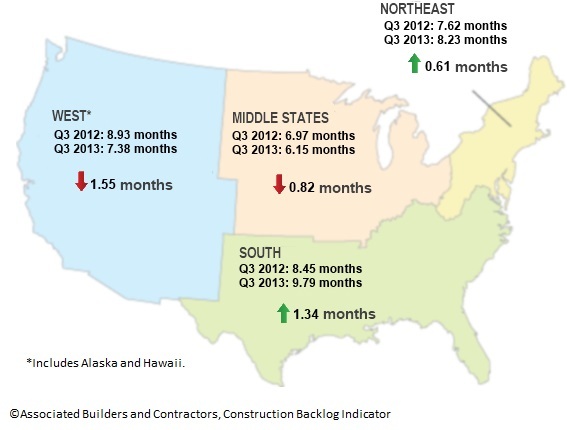 Despite the fact the nation is in its fifth year of recovery, nonresidential construction spending remains roughly 20 percent below the cyclical and all-time peak achieved in October 2008. While the most recent CBI is 2.8 percent higher compared to a year ago, it suggests the long-awaited rapid acceleration in nonresidential construction spending will not occur in the very near term. “For the past year, businesses and consumers grappled with higher tax rates, rising interest rates, a federal shutdown, and the uncertainties associated with health care reform, sequestration and debt default. In October, the International Monetary Fund downgraded the 2013 U.S. growth forecast from 1.7 percent to 1.6 percent,” Basu said “As if headwinds emerging from the federal government were not enough, the uncertain resolution of Detroit’s bankruptcy has induced more cautious behavior among certain large and similarly situated American cities, which continue to impact the outlook for U.S. infrastructure investment, “Basu said. 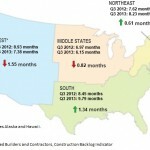 To read more about the 2013 3rd Quarter CBI, click here.